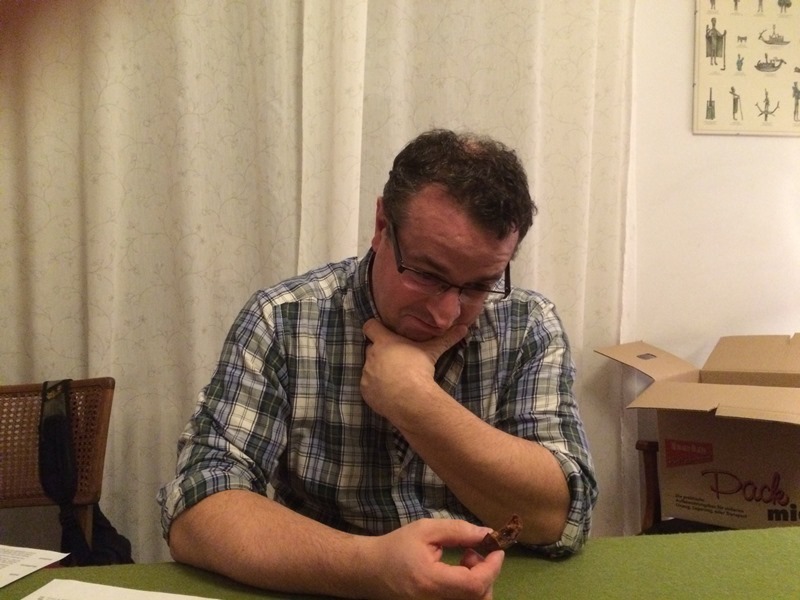 This Fantasy game was played on 2016-10-25 at Richard's place using Song of Blades and Heroes-Rules (set in ' Chronopia ') and 28mm miniatures. This report was written by Matthias. This scenario is your typical in-your-face-last-man-standing-wins type of game. 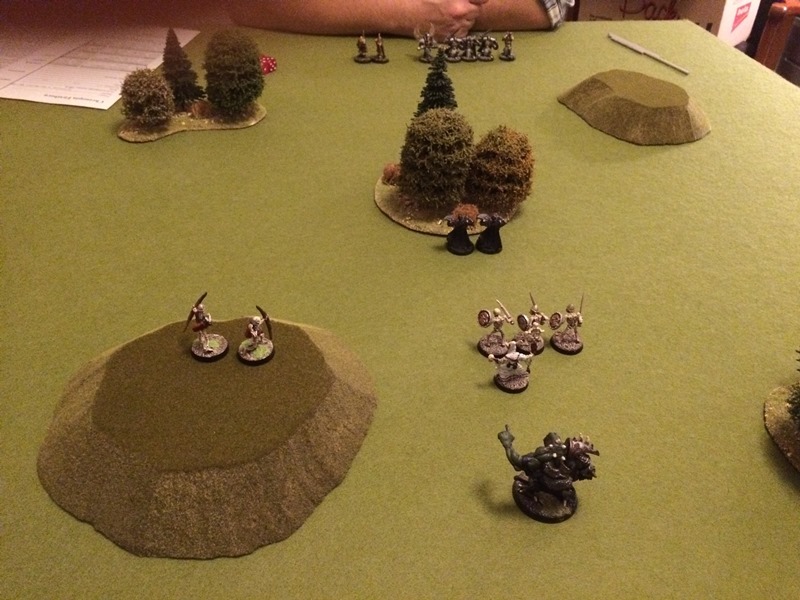 We used the same warbands as in our first game. 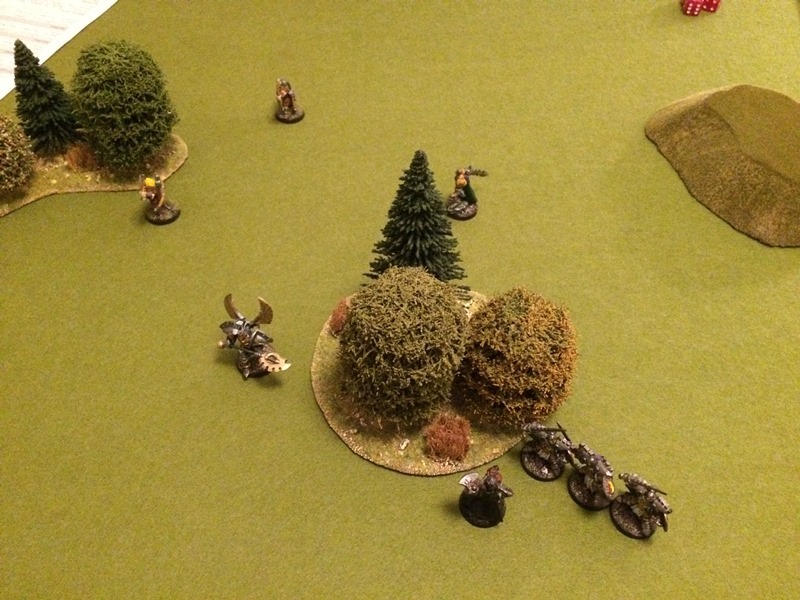 We used the simple campaign rules, which lead to the Mounted Axeman having to miss this game. Richard could have used some VPs to buy a warband advance, but to keep things simple, he forewent this option. 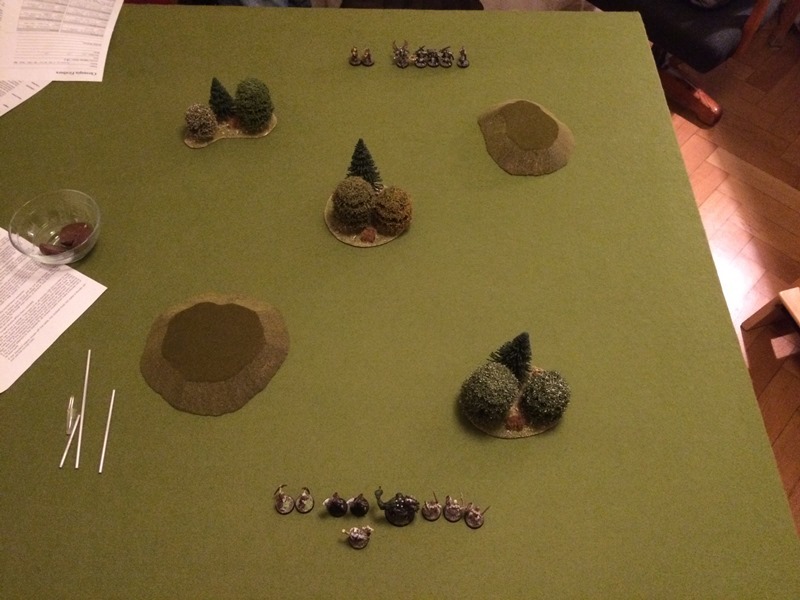 This battle took place in a wooded valley between two hills. 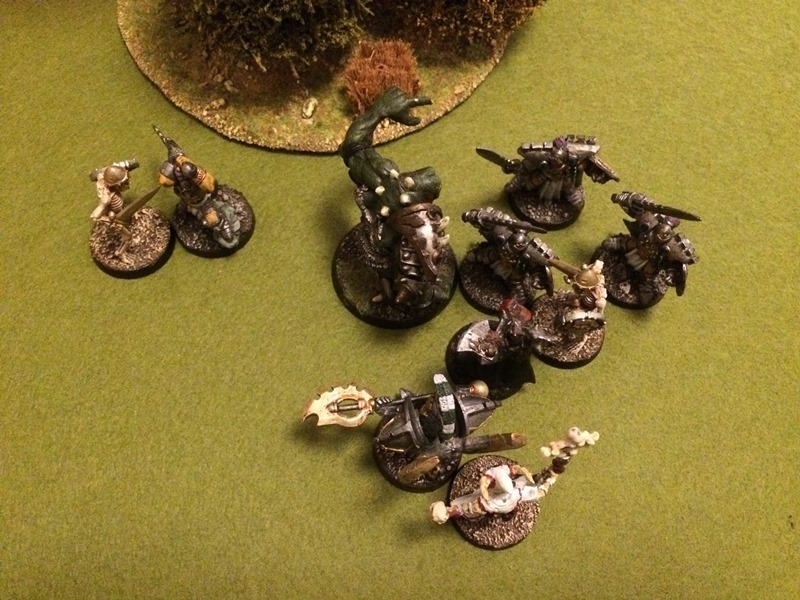 The Devout managed to advance all models except the Harbinger. 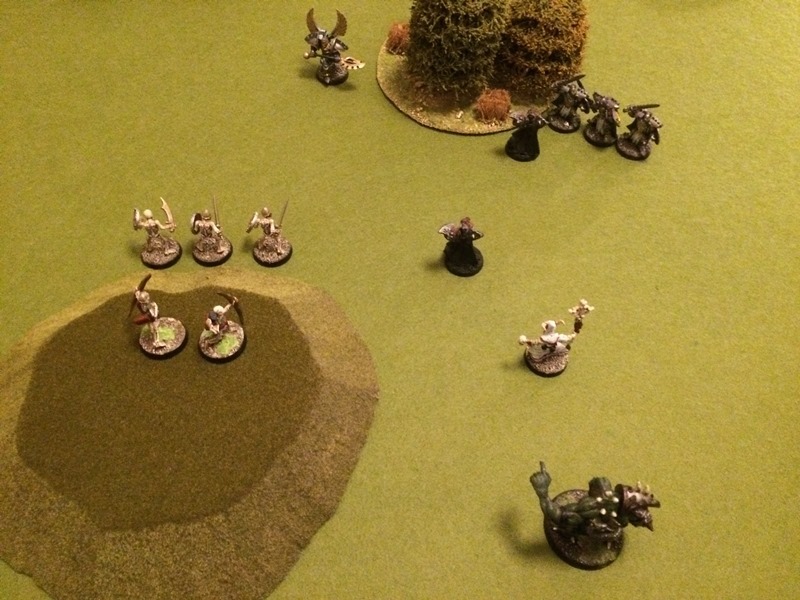 The Devout positioned some Skeletons in front of the hill occupied by the Skeleton Archers. After the initial indecisiveness of the Firstborn, the battle line finally advanced. The Devout initiative slackened, in this turn only one Skeleton was able to activate. Once rolling, there is no stopping of the Firstborn advance. 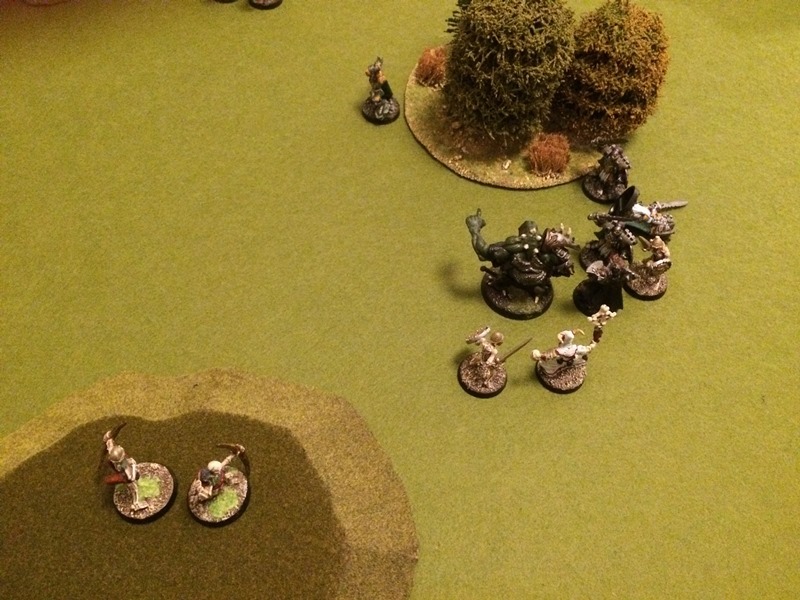 The Cursed wanted to withdraw closer to their own line, but the second failed all his activation dice. The Firstborn advanced further (even one of the Bowmen), but they had not enough actions to engage a Devout yet. The first Skeleton Archer was activated and sent an aimed arrow the Firstborn Bowman's way but missed. 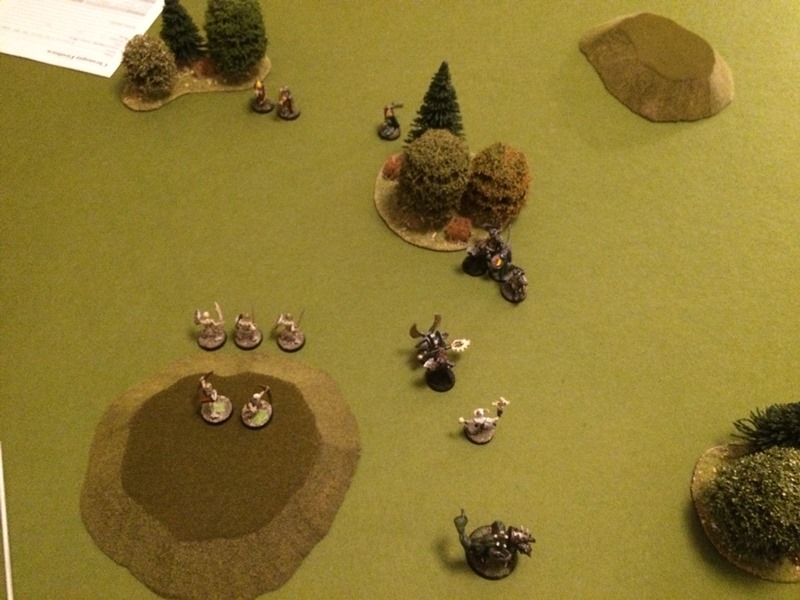 The second Skeleton Archer rolled two fails and one success on his activation dice, the one success was used for an unaimed shot also at the Bowman and of course also missed. The Enlightened charged the Cursed and pushed him back. He followed up to be able to continue the attack. 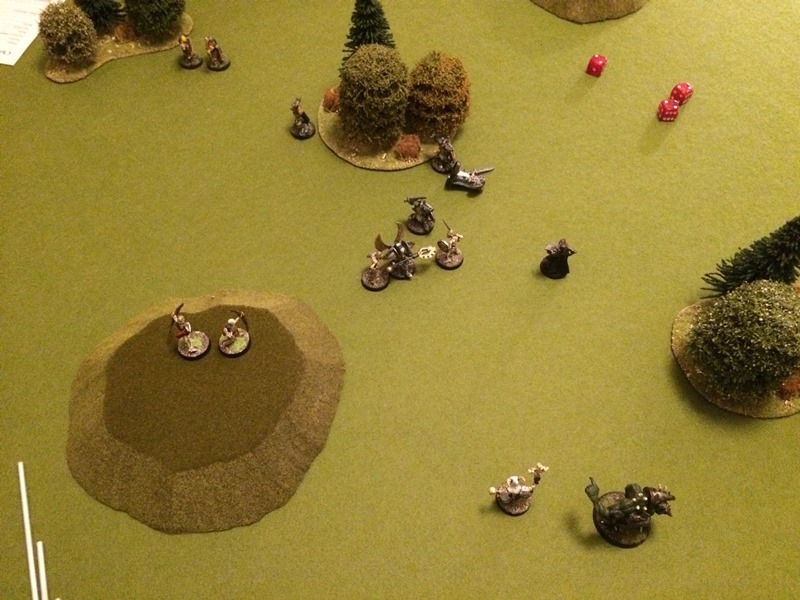 The swordsmen engaged the Cursed in front of the woods, but had no action left to attack. The three Skeletons ganged up on the Enlightened, then the Cursed attacked. Even with the outnumbering bonus, the result was a draw. 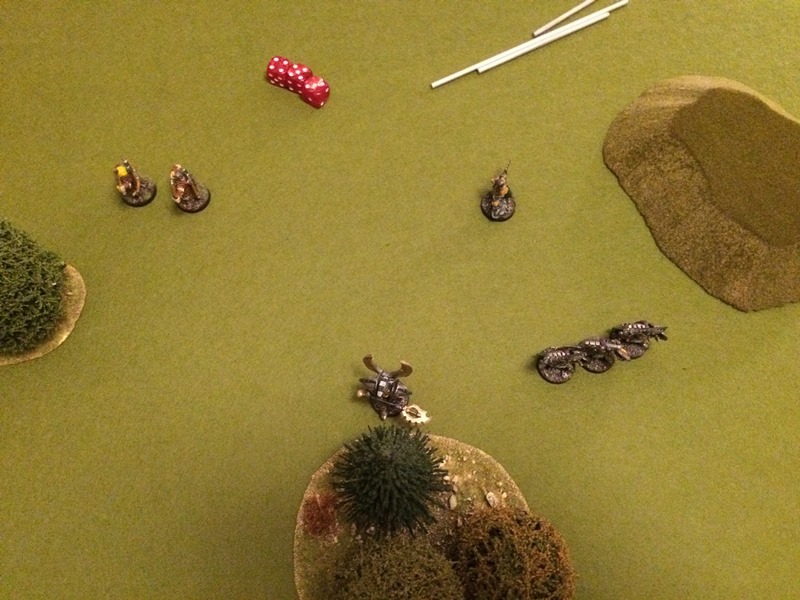 The other Cursed attacked a Swordman, loosing the battle by one pip - which was saved by his heavy armour. The two Skeleton Archers continued to shoot arrows at the Firstborn Bowmen, and also continued to miss. 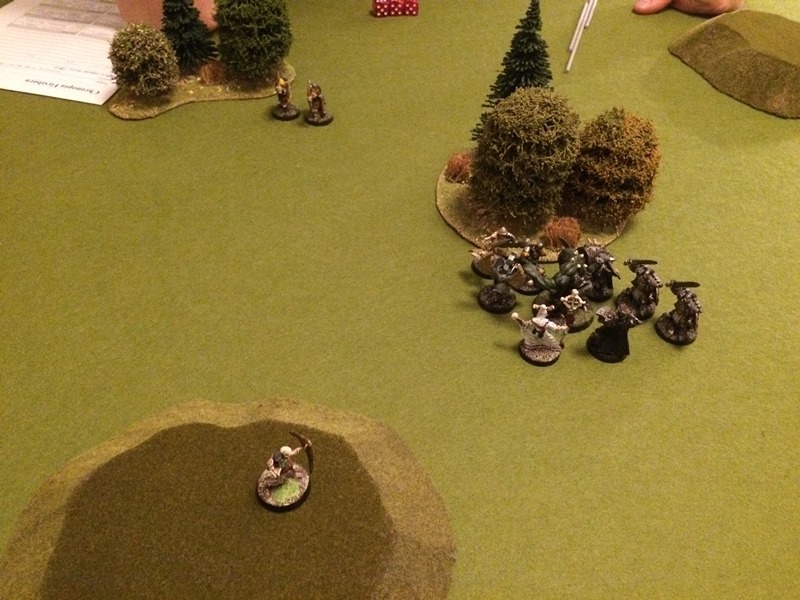 The Necromancer send a lightning bolt at a Swordman, but missed. 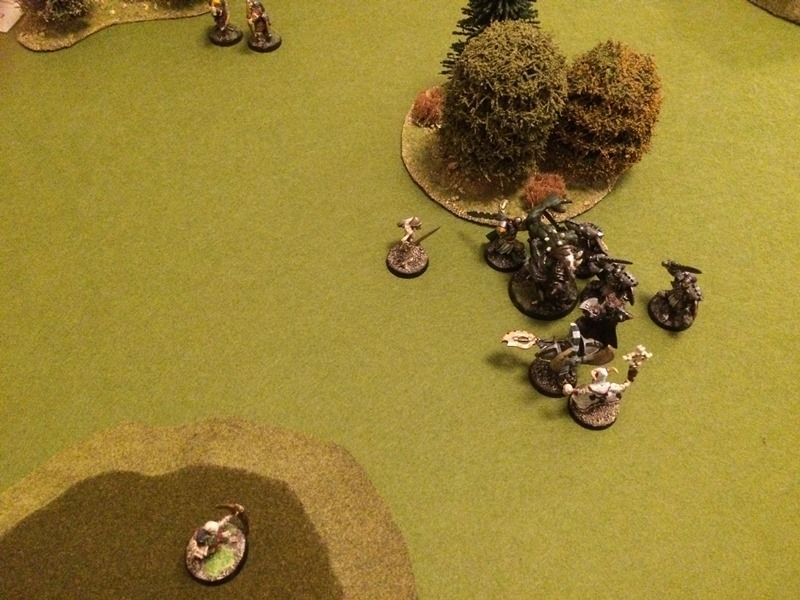 One Swordman charged the Skeleton at the back of the Enlightened, but had to recoil. His comrade attacked the Cursed, won the battle by one, which was again saved by the heavy armour. The second Swordman in contact with the Cursed also attacked him, but was brought down by the Devout, lying cringing in the dust. 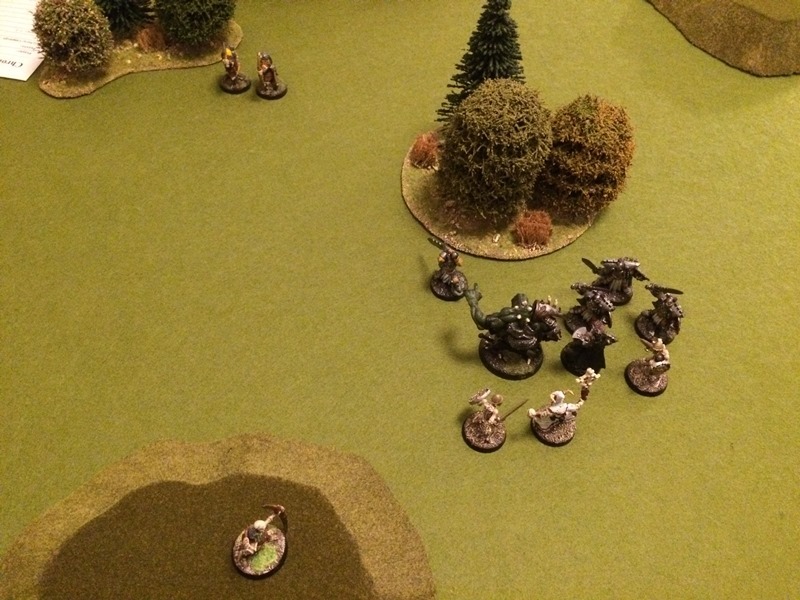 The Enlightened attacked a Skeleton and scored a Gruesome Kill. 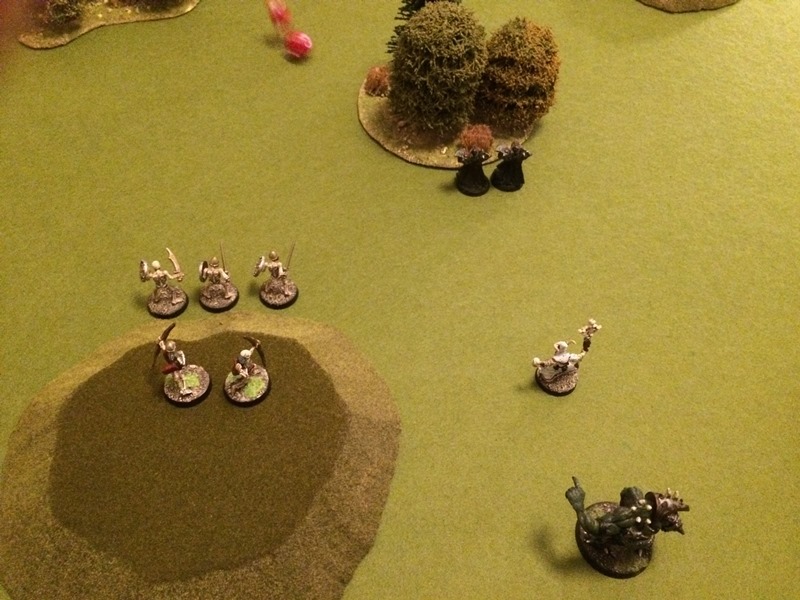 The Cursed in contact with the Swordmen failed his moral roll and ran away. He was hit by two free hacks, both of which would have killed him had he not worn his (by now heavily dented) heavy armour. The Harbinger retreated two moves, the Cursed engaged by the Enlightened failed three dice, threw down his axe and ran away for good. The Skeleton not in contact with the Enlightened moved in to distract him, which allowed the Cursed to charge in and trip the Firstborn. 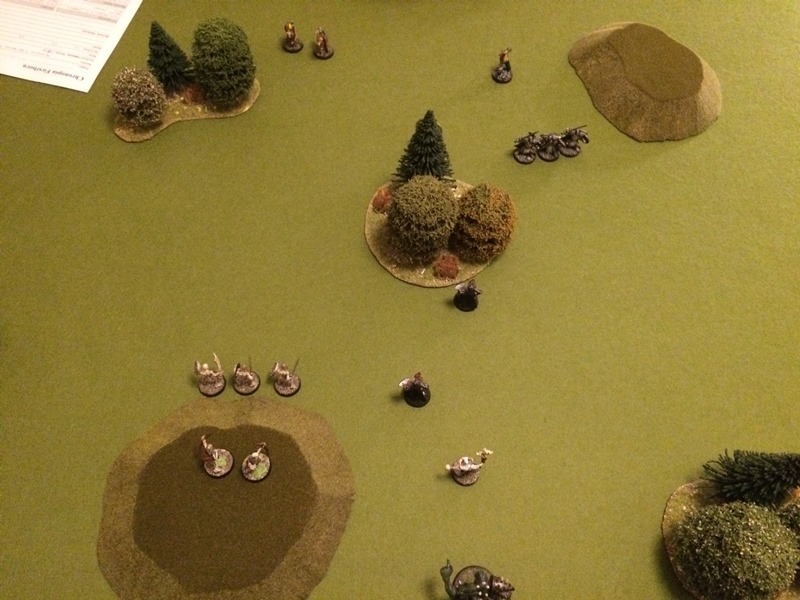 The second Skeleton then attacked the now prone enemy managing to exactly double the Firstborn's armour - a kill! 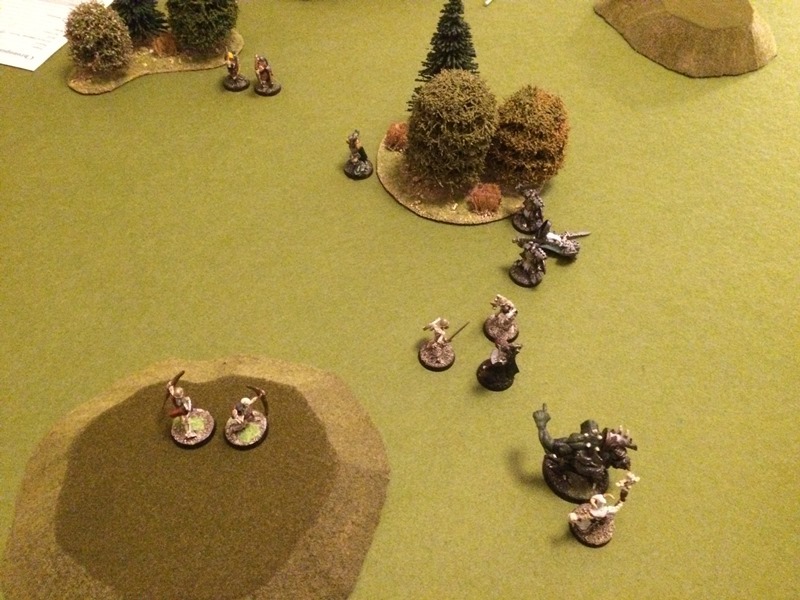 The Skeleton Archers continued to shoot arrows at the Firstborn Bowman, one missing the other scoring a recoil result. 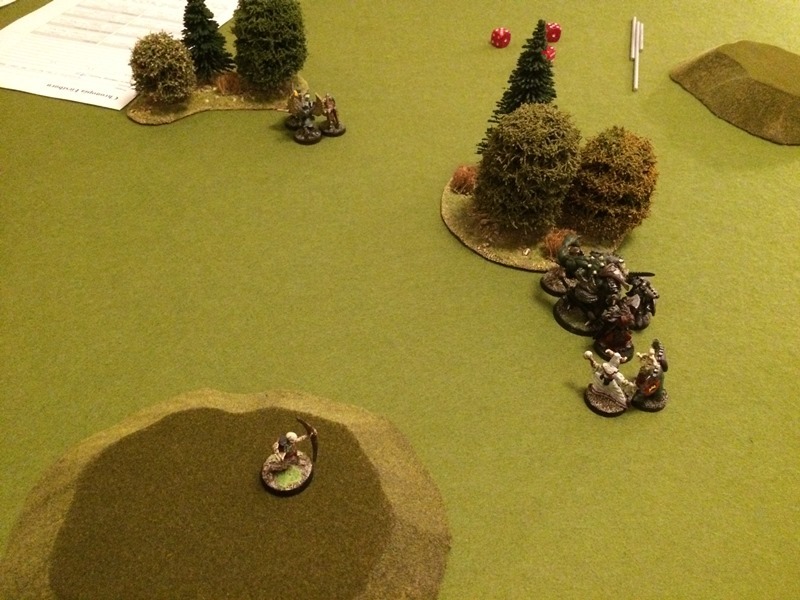 One Swordman moved up to flank the flanking Skeleton. The prone Swordman stood up. 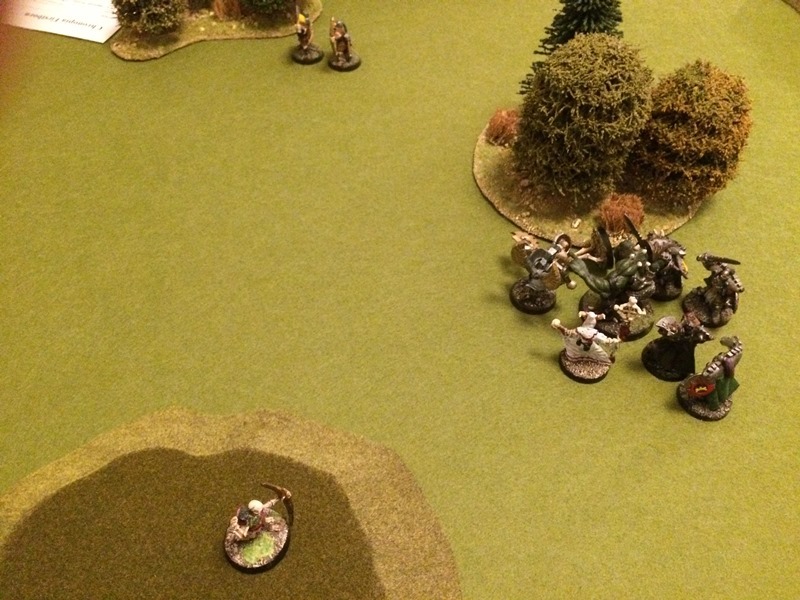 The third Swordman attacked the Sketon and scored a recoil result. One of the Firstborn Bowmen finally managed to shoot back at the Skeleton Archers, and immediately crumbled one to dust. 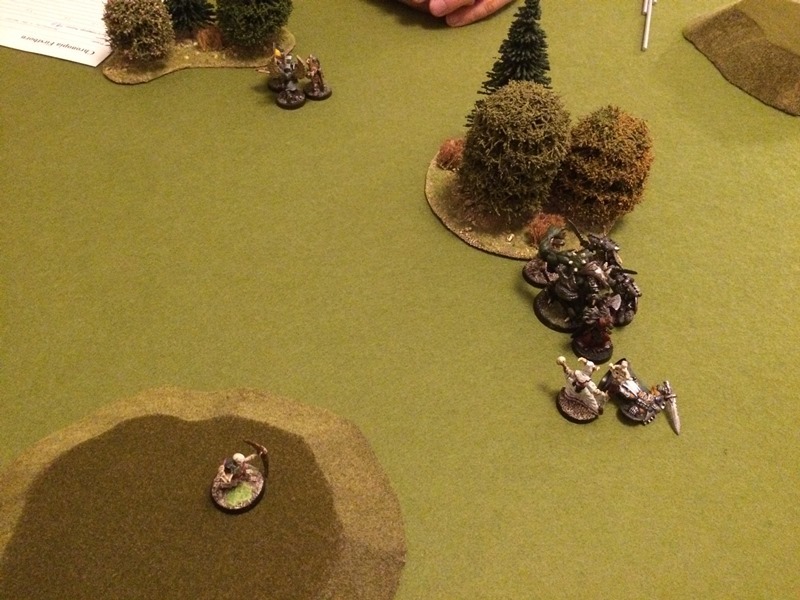 The Skeleton Archer attacked the Double-Handed Swordman but missed. The Cursed attacked a Swordman but only scored a draw. One Skeleton engaged the Double-Handed Swordman. The Necromancer then resurrected the Paladin which stood up, ready to attack his former comrades! Both Bowmen failed their one activation die rolled. 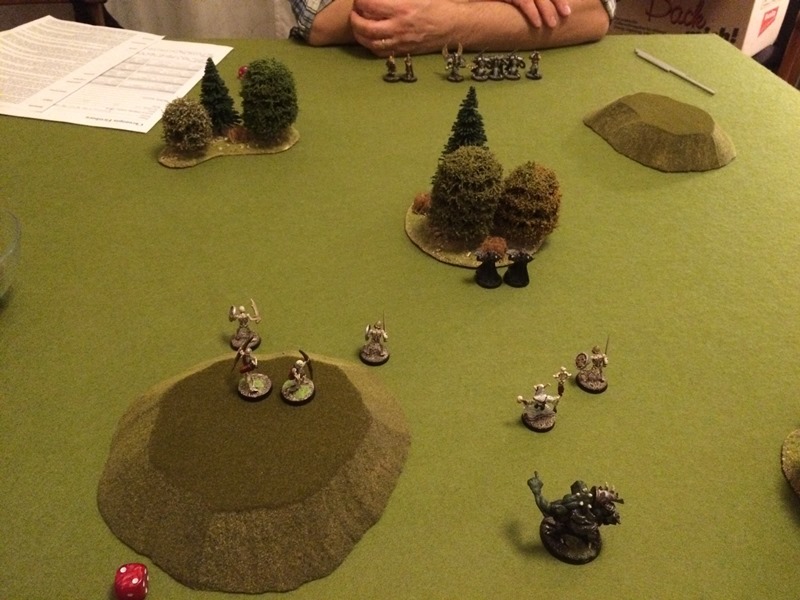 The Double-Handed Sowrdman risked the free hack of the Skeleton (which he easily shrugged off) to move to and attack the Harbinger, but only scored a draw. One of the Swordmen killed the Skeleton. 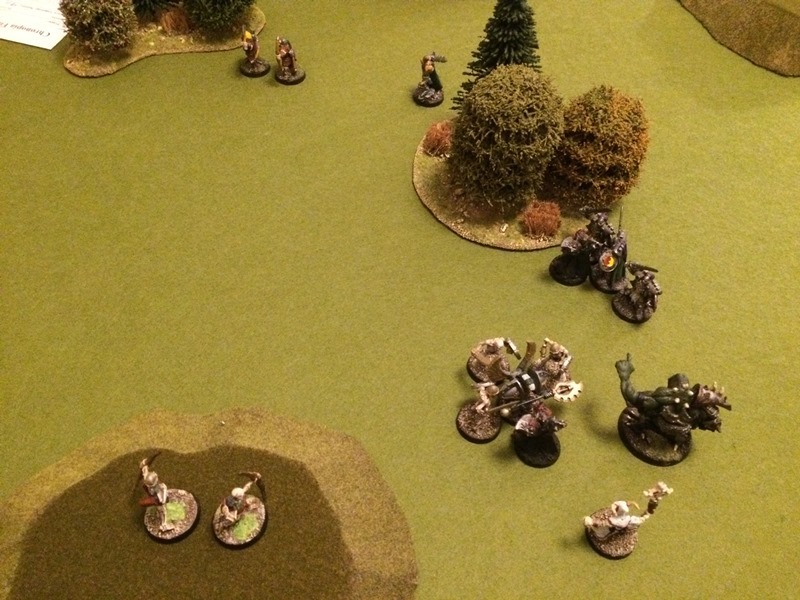 The Harbinger retaliated upon the Double-Handed Swordman, but also only managed a draw. 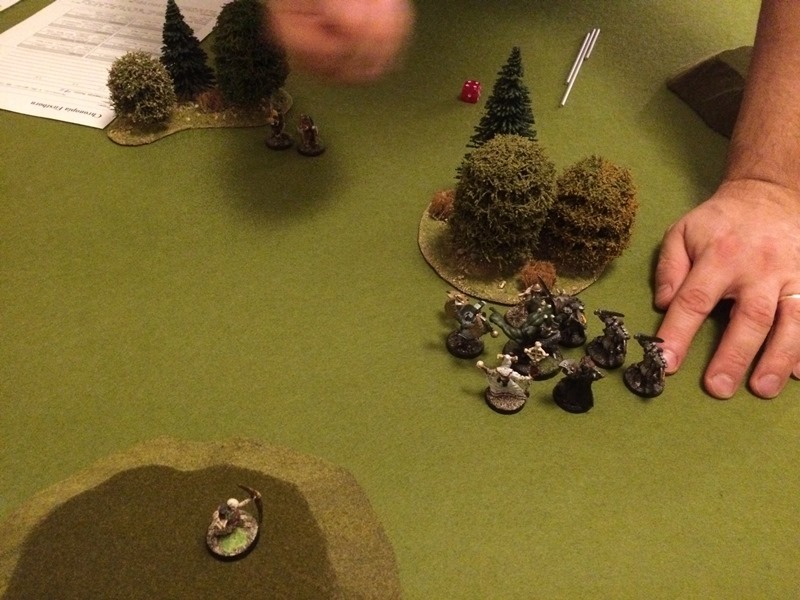 The Necromancer sent a lethal magick cloud at a Swordman but missed. The next Devout activation roll failed miserably. The resurrected Enlightened tripped the Double-Handed Swordman. The Harbinger then managed to kill the Firstborn due to the fallen down modifier. The Skeleton Archer tried again to kill his Firstborn counterpart, but again missed. The undead Enlightened charged the Bowmen, but had no action left to attack. 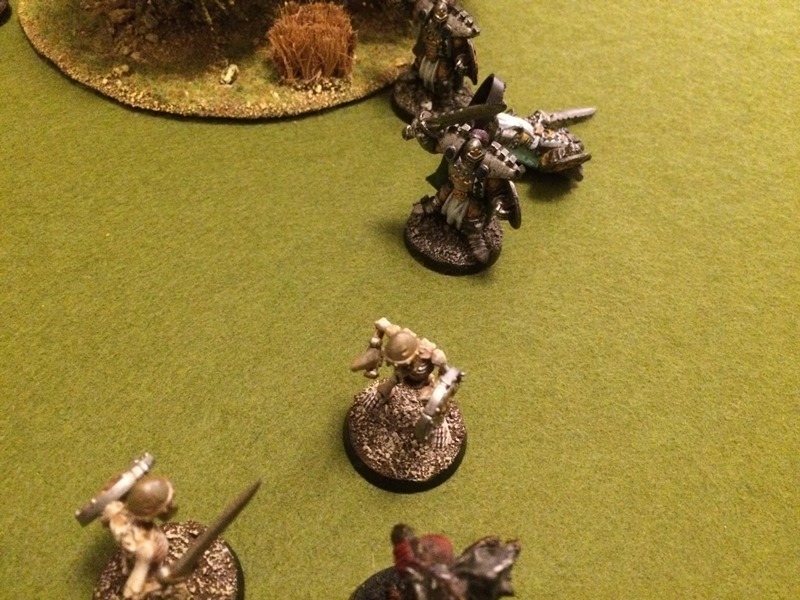 The Necromanced flanked a Swordman which allowed the Cursed to bring him to his knees. The Harbinger pushed bach a Swordman and followed up into the other one. 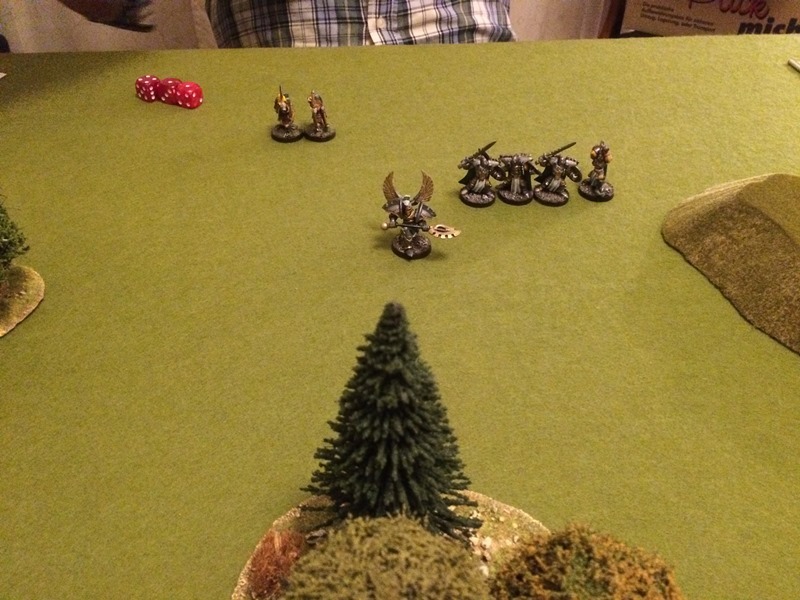 The first Swordman moved back in to engage the Harbinger, the second attacked the Harbinger but just scored a draw. Both bowmen again failed their activations. When I first read the description of the Heavy Armour trait, I thought this was pretty useless... saving you when the combat scores differ by exactly one? Did not seem much likely to happen that often. But this game saved one Cursed at least 5 times on exactly that rule! So I revised my opinion and am now a big fan of Heavy Armour! I think the relatively lucky roll of the Skeleton against the Enlightened (very much helped by that fallen modifier) was the turning point of the battle. Had the Enlightened survived, it would have been much more difficult to score a win.